There’s a lot of talk these days about knowing where your food comes from. Frankly, I think a lot of it is hype and when it clearly is hype it leads to a lot of eye-rolling from my side of the computer. But, that’s probably insensitive of me, because I am lucky enough to really know where much of my food comes from. I mean, really know – as in I have walked through the fields and talked to the growers. I’m pretty blessed that it’s my job to do so. A couple of weeks ago, I was one of a handful of news people invited to join a group of ag industry professionals on the annual Almond Board of California Almond Sustainability Tour. It was hosted by almond grower Dennis Jizmejian with Bill Diedrich Farms. It’s a family business, and Jizmejian is a fifth generation California farmer. He let us walk through his almond orchard, and talked about the many intricacies of growing almonds. He talked about having to make tough decisions during the drought, and how he respected his step-father’s insightful decision to buy extra water during the years California actually had it available, and saving it to use during the years we don’t. He let me pull him aside for a one-on-one and I was able to learn more about this farmer who supplies the almonds I have every morning for breakfast. He started out in crop insurance. “But I didn’t like sitting at a desk all day,” he told me with a chuckle. So, five or six years ago, he left the desk behind to spend his time in the almond orchard. It seems to suit him. I only got to spend a few hours with Jizmejian, and of that time, I only talked with him for a few minutes. But I liked him. He was open and free with the information he gave us on the tour (not hiding some evil plan, like so many people seem to think farmers are). When he talked about being in the orchard, his eyes lit up and he smiled every time. He was hopeful as he talked about the possibility of his sons following in his footsteps. “But it has to be their decision. I can’t make them want to be farmers,” he told me. And I think he really enjoyed showing another reporter (from a big city newspaper) that it’s okay to eat an almond – even green – straight from the orchard. 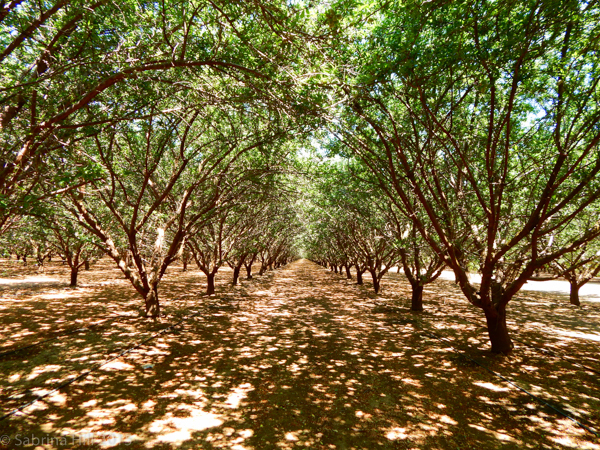 But what really sparked up passion in him – he stood up straighter, voice strengthened, and intensely blue eyes narrowed in thought and heartfelt ardor – was when I asked him what he wanted the public to know about the almond industry. He said the one thing he wants to clear up is the thought that California farmers were not included in the governor’s April 1 announcement of more water cuts. I haven’t given any details of the sustainability tour here, but if you want to know more about almonds and sustainability, check out my coverage of the tour here on the AgNet West website. **Spoiler alert** Almonds are not the water-hogging, pernicious, sinister villains they’re made out to be in Facebook posts and anti-farming articles. I wish people would think about that before they read a headline and hit the share button. Next Next post: I left my heart in – well, everywhere.